I have been an anxious person for as long as I can remember… No, sorry, let me rephrase that, I have had anxiety for as long as I can remember. The difference is that in the core of who I am, I don’t believe I am an anxious person, but that anxiety is a habit I picked up when I was a child. It’s how I learnt to deal with stress – be anxious, fear for my life! This is a habit that I wholeheartedly believe I can break and so can anyone else. It is my mission in life to be positive and peaceful and find a consciousness that allows me to be in control of my mind an emotions, and furthermore to help other people to do the same. I have come a long way from the nervous wreck that I was when I was 16, 17, 18 and even when I was 23 but my journey is on going. Along the way, I have faced many ups and downs, one of the most poignant being when I was diagnosed with Keratoconus – an eye condition in which the cornea becomes thinner, making it bulge out and gradually affects quality of vision. So here is my story of what my eyes were like before I was diagnosed, when they were diagnosed and after. While you are reading this, you might feel sad or worried for yourself (If you have KC), but I assure you there is a happy ending. SO, as you can imagine, when I was 16 and already worrying about every illness under the sun, it was terrifying for me to notice that ALL OF A SUDDEN my vision was weird. Really weird. It was like I suddenly became aware that my vision was blurred and hazy. Doctors, family, opticians all put it down to stress and told me it was because when you are anxious, your pupils dilate and this can cause blurred vision. This is true but unfortunately this time nobody picked up on the fact that it was not the case with me. I got some glasses. They lasted about 6 months. So I went back to the opticians and got some more glasses. They lasted about 6 months. So I went back to the opticians and got MORE glasses. Every time my visions changed, I panicked and became obsessed with my eyes. They were getting worse every six months. When I rang back the opticians the lady on the end of the phone would always say ‘But you are not due another appointment for 1 and a half years’ – this was horrible to hear because I just knew something was not right. I was utterly convinced I had a brain tumour. I became extremely scared of opticians and always got someone to go with me in fear that they were going to see something nasty at the back of my eye. They never found anything nasty. They would reassure me, give me a new prescription and send me on my way with another bill and some expensive glasses. Mum wasn’t happy. The worst thing was that any prescription they ever gave me, never made my sight much better. Maybe a little bit, but my right eye was NEVER fixed with glasses. The thing was that there was a cry wolf situation going on here. I was ALWAYS worried, about so many different illnesses, a total hypochondriac. So when I was worrying about my eyes, nobody took me seriously. For anyone reading this who is anxious and a hypochondriac, what I have just written is an absolute trigger for a panic attack – the idea that maybe your fears are true, maybe there is something wrong and nobody is listening, how can you know for sure?! This uncertainty is something we all need to learn to live with. I know so well how hard it can be but trust me, it becomes easier with time. So anyway, 7 years later and god knows how many eye appointments. I decided to start driving again. Took my glasses which I knew didn’t work to a refresher lesson. It was terrifying. The instructor kept asking me ‘What can you see ahead?’ and I had NO idea what he was talking about!! The lights of the oncoming cars were SO BIG that I thought they were in the middle of the road coming right at me, so I was swerving out of the way! My instructor stopped the car and asked me to read a number plate and I couldn’t read it. I was not calm, not at all. I absolutely knew something was wrong. I went home in shock of the lesson and told my mum for the millionth time, ‘My eyesight has changed and now it’s really bad’. I do not blame her or anyone for being frustrated with this. It must have been very annoying and seemed like another one of my obsessions. I went back to the opticians, shaking this time, and I told her my worries. They couldn’t work it out and she suspected I had an undiagnosed lazy eye. She referred me to the hospital. The wait was about 4 weeks and by this time I was at the most anxious I had ever been in my life. It was actually at the point where I was having panic attacks almost constantly and sometimes I felt like I could hardly walk or breath. I couldn’t work although I did try to teach music, dance and drama to kids on a Saturday. I remember feeling overwhelmed with fear and trying to hide it. I remember looking around my class and thinking ‘I shouldn’t be here, I can barely even see my students’. The fight or flight response was well and truly in action. I thought I was going to die of something awful. I even took myself to A and E one day and cried all the way there! I waited there till 3am for them to tell me there was nothing wrong with me, I just had high anxiety. Or off the scale anxiety in my case! I really did feel hopeless at this time and I was so upset. I felt like my youth was just slipping away from me and that I was never going to be able to achieve my dreams and ambitions, especially in music. I had no social life and it was too hard to work. I felt like the bane of everyone’s’ life and I couldn’t see how it was going to get better. It was honestly a total nightmare and very sad for my family to see. They wanted to understand and help but they couldn’t and I KNOW how hard they tried. They were actually amazing. pography, which scanned the shape and thickness of my cornea. ht or flight. I remember feeling so relieved that after 7 years, there was finally a reason for it all! I WASN’T MAD!!!!!! I was right all along! 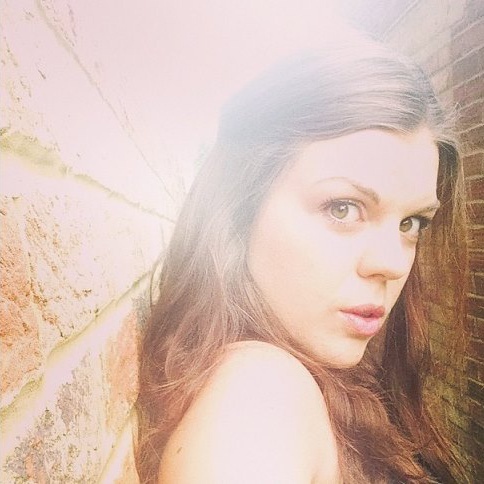 My first bit of advice in this blog is to trust yourself and listen to your gut feelings. Sounds cliché but its so true. You know you better than anyone. I always knew there was something wrong and the fact that nothing was picked up on never changed that. I left the hospital feeling anxious that my sight was going to get worse and worse. I wanted to look at everything in detail and be grateful for the sight I was seeing at the time! I was trying to be positive but I didn’t feel it. ach other, it’s important to make sure you don’t become reliant on it and that you don’t keep reading stories that will make you afraid. I had another hospital appointment which I thought was going to be to get me prescribed with some lenses but it was not. It was a formal chat about the seriousness of my condition. It was a chat about what the worst and best case scenarios could be and it was a chat about the options I had. The doctor made it all sound so scary. I didn’t like him; I thought he was uncaring and just blunt. He told me about crosslinking and said I needed to go on a waiting list and that the waiting list was about 6 months. He then also said that in 6 months time my Keratoconus might be so bad that I wouldn’t be eligible for any treatment. I was getting more and more frustrated with him. I couldn’t understand why if he thought my case was so serious, he wasn’t doing anything about it sooner. The whole thing was just a joke to me and I felt like I meant nothing to him. He just wanted to put me on a conveyer belt and forget about me as soon as I left the building. I was hyperventilating, seeing stars and before I knew it and very nice man was holding an oxygen mask to my face because I fainted!!!! I found her phone number and called her immediately. SHE was the turning point because she made me realise everything was going to be alright and my anxiety started to feel a bit better. She talked to me about crosslinking about told me about a practitioner called David Jury. I emailed him straight away and got a private appointment at a clinic on Harley Street. My lovely 80 year old grandpa, who was a doctor, got the train down and came with me. It was amazing. It lifted my spirits so much. David did so many tests and told me everything there was to know about my eyes. He was so kind, patient, and knowledgeable. He listened to all of my fears and gave me answers to all of them. He explained how crosslinking works and how it would be done. Both sides of my family came together and paid for me to get both eyes treated with crosslinking and my first appointment was 1 month later. It all happened very fast. It was very scary having a mini eye procedure. I had so many eye drops and anaesthetic to make my eye numb (thank god!!). I remember while David was doing it, I had a spring in my eye to keep it open and all I could hear was the clock ticking. There was nothing to do except hope time went fast so I talked to David about the Olympics! So weird. Lying on a cold table, with a spring in my eye, while someone is dropping yellow stuff into it, shining a bright light into it! I can tell you that the Olympics were the very last thing on my mind!!!! But David was so relaxed; he’d done it a million times before. When I came out, I had an eye patch and felt soooo strange only having one eye to see with! The journey home, in a taxi, on the tube through London and another train back to Cambridge was possibly the worst journey of my life. The anaesthetic was wearing off and the pain was unbearable. BOTH eyes were watering like crazy and I couldn’t keep my head up. I didn’t want to look with one eye because it felt so weird. My eyes just kept closing, no matter how hard I tried to keep them open. I remember sitting on a chair with my head in my hands at the train station and this really hot guy came over and asked if I was ok!!! I was thinking ‘Oh bloody hell, why now?! Hot people hardly ever talk to me, why when I look like this? !’ Haha!! He was very nice anyway but I never saw him again! I finally got home to Cambridge and had so much pain relief that I felt totally out of it. My mad friends turned up at my house at 10pm pretending to be pirates so that I wouldn’t feel like that odd one out with an eye patch on!!!! It was so totally bizarre and awesome. We all made a den in my garden and stayed up till past midnight chatting. Pain was coming and going but getting easier. 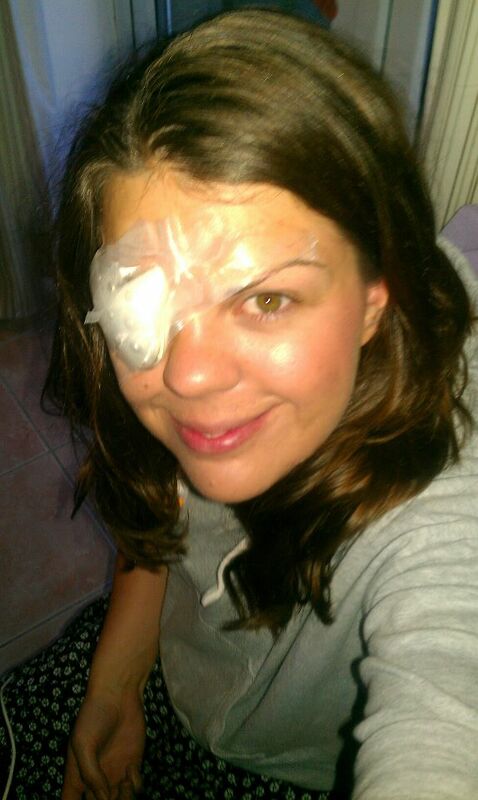 The next day I took the patch off and couldn’t see a thing out of that eye, which was to be expected. It was sooo hazy and strange. It took an abnormal amount of time for the haze to clear. Maybe 3 or 4 weeks so don’t worry if that happens to you. Everything went fine with that and guess what? I was back to work within a week!! Granted, I couldn’t see that well but I was able to work in a language school anyway. This boosted my social life and my overall happiness. Things were looking up. I started making jokes about my eyes and being grateful that I have eyes in the first place although I had times where I would worry again. 3 weeks later, I had the second eye done and was more nervous this time because I STUPIDLY watched a video on YouTube of what they do in the cxl collagen crosslinking procedure. Don’t watch it, I’m not even going to tell you about it. But anyway, that was over and done with before I knew it and it was fine. I always felt so safe with David Jury. He was so great and I HIGHLY recommend him if you are considering crosslinking or intacs. He also gave me his number so that I could call him if I had any problems. A few months later, I had my first contact lens appointment and mum came with me. We tried a few different things but when I put the lenses in for the first time and could see 20/20 in both eyes, it was honestly the most amazing thing ever. My mum cried of happiness and I was lifted from my dark cave of fear. The day I went to collect the lenses, I walked out of the room and through the hospital corridor on my own. I will never forget walking down that corridor in absolute awe that I could see the whole way down and that the people were not blurry. It was like having new eyes!!!! My life was truly looking up. I had more energy and all of the horrible fight of flight symptoms had gone. Since then, I have been learning to live with Keratoconus and its ups and downs and creating a positive attitude towards my eyes. I have also been taking as many opportunities as possible and not letting Keratoconus get in the way. 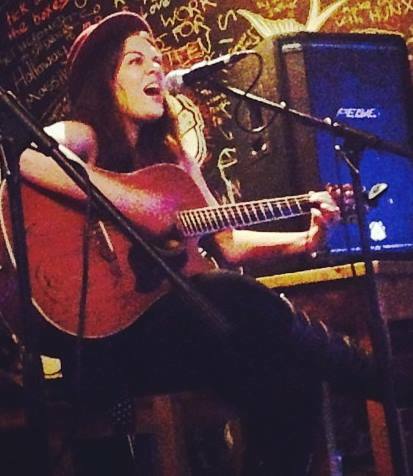 In particular, I have been writing songs and really going for it with my passion for music. I have found THE single most important thing in living with Keratoconus to be my attitude towards my eyes. I LOVE my eyes. I LOVE the fact I can see at all! I LOVE the good eye days so much and literally walk about so grateful for the gift of being able to see this beautiful world. I actually think that for me, Keratoconus has been a blessing in disguise. It has ‘opened my eyes’ to things I didn’t notice before and helped me to live with uncertainty. Part of having Keratoconus is learning to live with the fact that we don’t know what our sight will be like tomorrow. Will it be a good day or a bad day, who knows? But either way, I have found that now there are far more good days than bad days and I don’t freak out if I have a mad day, or even a bad week although it can be very annoying. I know it will all be ok. Part of this calmness has come from surrounding myself with caring and knowledgeable people. They bring so much reassurance and peace of mind and a highly suggest that you find someone you can talk to who really knows about the condition for those times you feel worried. very good at doing this! When I look back at before I had lenses I wonder how on earth I got by and did a degree at University!!! It is totally amazing what we put up with isn’t it!? 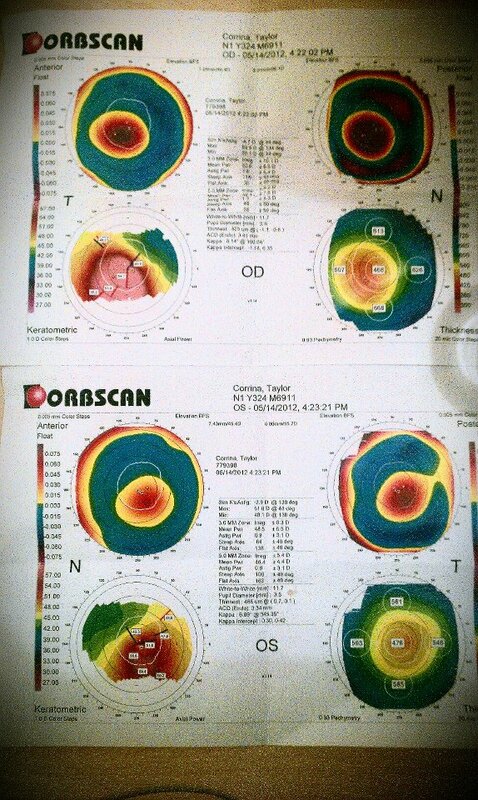 I have had quite a lot of prescription changes since my crosslinking as my eyes are settling, but so far everything is good and the eye maps actually show an improvement. I am now reading the BOTTOM line of the chart with my contacts in which amazes me every time. I am so grateful! Last year, the very same week I got my first pair of contact lenses, I went to Lapland in Finland, to work as an elf for a Christmas holiday company! My eyes were not a problem at all and I just loved seeing!!!!! In fact, it was so amazing because Lapland is a very beautiful place and it was so great to be able to see it so well! One highlight was going husky sleighing through a forest while the moon was coming up! I have big dreams ahead of me. So me and my Keratoconus have a long journey ahead of us!!!! In terms of my anxiety, I am nowhere near the girl I was at the beginning of this story. I have learnt such a lot and am continuing to learn about ways in which I can gain control of my emotions. One thing that has helped is meditation and allowing myself to be scared sometimes. We’re humans, without these emotions, we would be aliens!! We need to nurture and love everything that we are and try to be really nice to ourselves because this naturally makes us nicer to others too!!! So if you have Keratoconus, please know that there’s someone here who KNOWS how you feel. Try to see the positives, embrace the good and bad but focus on the good things in your life and what you want to achieve!! You won’t believe it’s possible until it happens, so go for it! When you worry, try to focus only on the moment that you are in because worry can’t exist when you’re not thinking about the future. ← My Love/Hate Relationship with Air Conditioning! Thanks for sharing your KC journey Corrina. I can certainly relate about suffering from anxiety & it is very difficult not to let it literally take over your life. I’ve got really bad OCD with related panic attacks & at times depression. I do believe the OCD started when I first noticed the eye issues & it escalated on from that. You have a great attitude towards life in general & I hope you achieve everything you want. Hey wendy!! Yep, I know how you feel. OCD is horrible, I have had that in many forms, but you can learn to make it history. You are not your anxiety, your anxiety if not you. It’s a learnt behaviour and it can change. I found it extremely helpful to research ways of GETTING RID of inappropriate anxiety, not just living with it! Where there is a will there is a way! Yes, I’m extremely grateful for life and so grateful for everything. I think that’s the flip side of anxiety, it made me able to love my life instead of fearing losing it! Thankyou for your kind words and support!!! Thank you so much for sharing your story with us. I have a very similar story and, like you, must constantly remind myself of the blessings and great things in life. Cheers to you on this Thanksgiving day and best of luck with your music career! Hi David. Thanks for posting. Sounds like you may have had hydrops? what treatment do you get now? have you seen an eye doctor or consultant recently? Most people after a graft wear contact lens to correct their vision- have you tried these? there are no many types to choose from. For more info do join KCGB on Facebook we have a page and a private group with over 3300 members where you can hear many experiences and learn more about what is available for you. You should go and see an optom/ corneal specialist and get some tests done and look at treatment options. There’s no need to settle for poor vision so many advances have been made today with contact lenses and surgery.